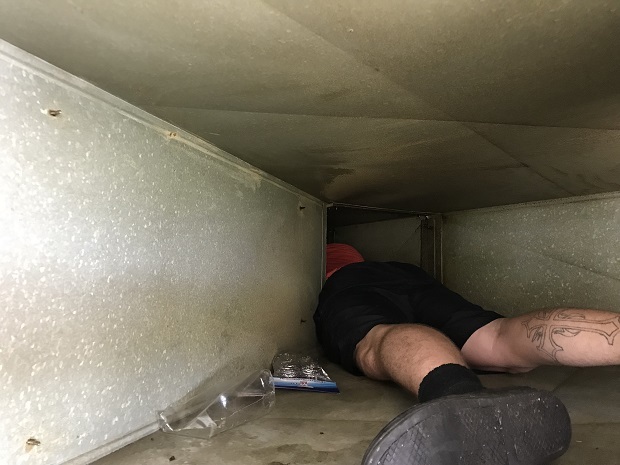 Nothings Awkward for this Sunshine Coast Commercial Duct Cleaning Job at Coolum Beach. You are here: Home › Nothings Awkward for this Sunshine Coast Commercial Duct Cleaning Job at Coolum Beach. As the pictures depict Nothings too Awkward for this Sunshine Coast Commercial Duct Cleaning Job at Coolum Beach. Over the last ten years as a professional kitchen duct cleaner, I have acquired a large number of clients up on the Sunshine Coast and we now travel to their on a weekly basis. 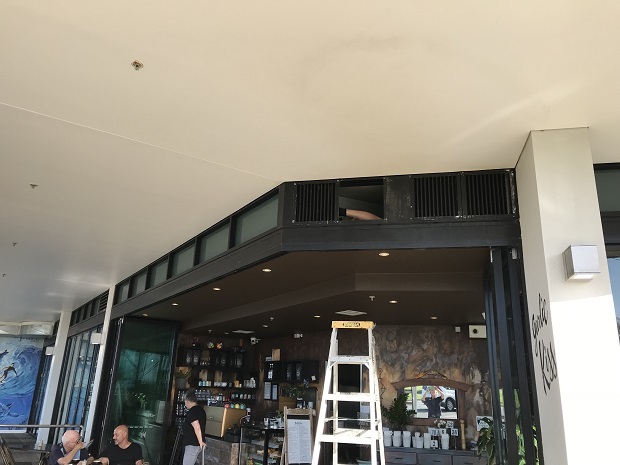 In this instance the owner of this Sunshine Coast restaurant had run me, indicating that he has been getting his commercial kitchen canopy cleaned on a regular basis but was concerned that his ducting and commercial exhaust fan had never been touched. A quick drive by to Coolum confirmed this was the case . 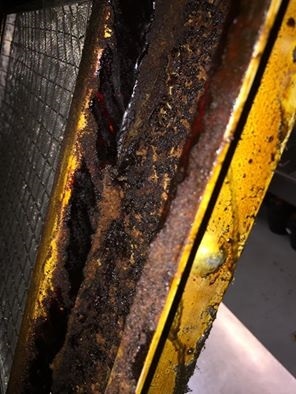 Although not a particularly dirty section of kitchen exhaust, it was clear that a level of neglect was starting to develop and over the next few years of neglect , the kitchen ducting would no longer be firesafe. 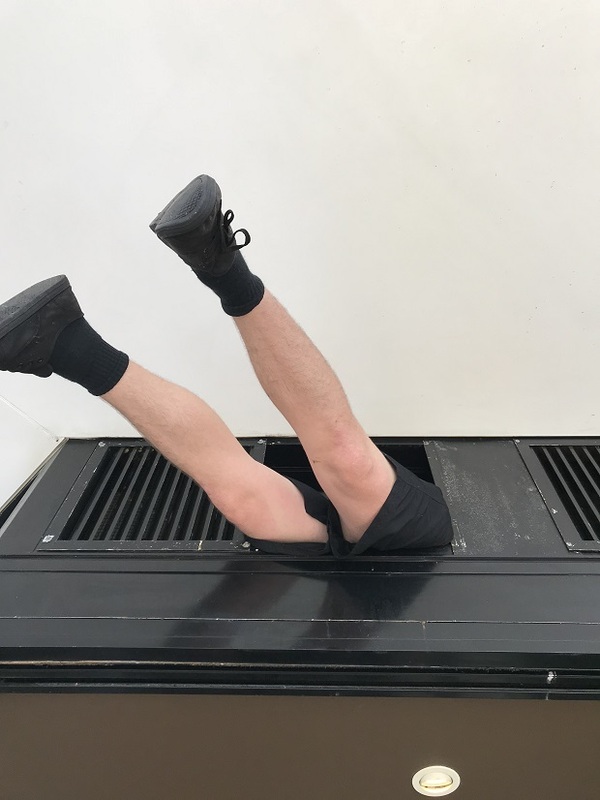 So with the aid of a long ladder a bit of support one of the staff removed the ducting cover, where he cleaned the immediate area of duct that would allow him to slip his body into the first area. Then merely in systematic way he just begins to clean along the ducting until he is able to reach directly above the kitchen canopy. Most of the time this area is clogged with a substantial about of residual grease which make the area a fire hazard. A splash back of flames in the kitchen often ignites this layer of grease. Rendering this area not fire safe. Although this process appears very simple to me . Its the simple case of out of sight out of mind. Sadly this Sunshine Coast contractor that was doing the job at the Cafe but simply took a short cut as the expense of the owner. And talking about expense. I must say I am still charging $200 less but doing three times the work. We simply work our way up cleaning as we go. Or Start on the left side and work across. Generally most holes can be breached, fortunately many of my staff are of slight build so can get into many tight areas.